There’s a new, somewhat surprising trend going on in homes across the nation; surprising because it involves the words “vinyl” and “luxury”! That’s right – vinyl is now luxurious! In fact with luxury vinyl tile and vinyl plank flooring (LVT & LVP for short) what we’re dealing with is a whole new kind of vinyl, one that is indeed much more sophisticated and much more desirable than the plasticky sheet vinyl of the 70s. So what is LVT & LVP flooring and what makes it so different? For a start, this is not vinyl in sheets, LVT flooring refers to luxury vinyl tiles and LVP flooring is luxury vinyl plank flooring. Secondly, and this is the most important bit, new printing and photographic technologies means that luxury vinyl flooring can be made to authentically mimic both the look and the texture of real wood or stone products (the best stone-look tiles will actually have limestone composite added to the vinyl mix for greater authenticity). But best of all, these “nearly real” luxury vinyl tiles and vinyl planks are often cheaper than the real thing! It is this combination of price and fantastically improved realism that is proving the defining reason for the rise and rise of LVT’s popularity. “the look and feel of nature’s best materials at a lower cost are a reality of luxury vinyl tile flooring manufacturing”. LVT is so realistic these days that you can even get specially formulated grout to finish off stone-look tiles for extra realism. And then when you add to that the inherent high performance, durability and easy maintenance of vinyl – you’re clearly onto a winner. LVT also offers a lot of flexibility design-wise. Along with wood and stone looks, there are graphic patterns, block colors and unusual textures also available such as mosaic pebbles or indented steel panels – see below for our round-up of the biggest LVT design trends. What’s more, as vinyl wood flooring is often installed as a floating floor, it also offers less permanent flooring solutions than the authentic materials. This is a huge plus for both interior design magpies and people who aren’t yet living in their “forever home”. For all of the above reasons, luxury vinyl planks and tiles are now being featured in all areas of the home. While vinyl was once considered only suitable for less visible areas of a house like the laundry room, or in areas where you would expect its durability and water resistance to be useful like kitchens and bathrooms, designers are now using it everywhere! We’ve already touched on some of the advantages of luxury vinyl flooring but here is a simple and straightforward breakdown of the pros and cons. Unlike carpet, dust and dander won’t get embedded in vinyl. Look for LVT with FloorScore IAQ certification to avoid vinyl that might emit VOC’s in the first couple of years. Most LVT ends up in a landfill when disposed of, not great for the environment. Don’t put ribber backed mats on LVP or LVT flooring. And cheap luxury vinyl made fade with prolonged exposure to strong sunlight. Another much touted advantage of luxury vinyl flooring is that it’s easy-as-pie for DIYers to install. Well, sometimes this can be the case… but NOT ALWAYS! As with any home improvement project, the results will always reflect your level of experience. LVT flooring installation can be easy if you’re a relatively proficient DIY enthusiast and if you’ve taken time to consider all aspects of the project. Most important in this regard is to understand that the substrate that you apply the LVT to must be in top condition, perfectly clean and primed, level and of a suitable material. Referring to manufacturer’s guidelines is key here. There are mainly two kinds of LVT installation methods depending on the tile you buy – ones that glue down with the recommended adhesive products and ones that don’t need adhesive but rather have an inbuilt interlocking or tape down system. Both types have specific guidelines for installation, and again we would urge you to refer to the manufacturer’s recommendations. There are also a number of other technical considerations to be aware of, including correct tools, expansion gaps, edgings, cutting techniques, acclimatization time and installation time. For more detailed information on how to install luxury vinyl tile check out this great DIY article from The Family Handyman and here’s interior designer Jenna’s experience of installing luxury vinyl tiles with tips and tricks worth reading – jennaburger.com. If all of this seems too much for you, or if you’re planning to install LVT throughout your home, you should opt for professional installers who will also guarantee their work. Finally, LVT finishes and performance really vary depending on the quality of the product. To this end we have reviewed some of the most trustworthy and top quality luxury vinyl flooring brands below. As luxury vinyl tile is a man-made product, you would imagine that there are endless design ideas to choose from. And yet, I think precisely because the point of LVT is to mimic authentic materials, most manufacturers tend to offer a fairly simplistic choice of either wood look or stone look tiles. Of course, within those two choices the sky is the limit! For just about every kind of “real” type of stone or wood flooring product, you’ll find its equivalent in luxury vinyl plank flooring or tile flooring, which means that you can recreate just about any interior design trend with LVT, be it rustic or minimalist. Flooring can be personalized in almost any style you like: luxury vinyl wood planks can be laid out in parquet style patterns, vinyl stone tiles can be set in checkerboard sequence, and many manufacturers are make luxury vinyl borders, medallions and insets to match their collections. From reclaimed, hand-scrapped, distressed wooden planks to whitewashed woods; from smooth as silk marbles to rougher slates, it’s all available in LVT. However, some manufacturers are offering slightly more adventurous LVT products that are distinct in NOT attempting to mimic the real thing but instead offer decorative, geometric and graphic designs or overall floor patterns instead. You still get the great durability and ease-of-care benefits of LVT but these tiles are more like an alternative to carpet, and as such create quite a personalized statement. It can only be hoped that as luxury vinyl grows in popularity, these bolder floor designs will become more widely available. 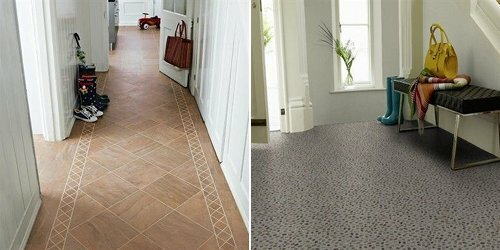 For now here are our luxury vinyl flooring reviews of the most popular and well known manufacturers. 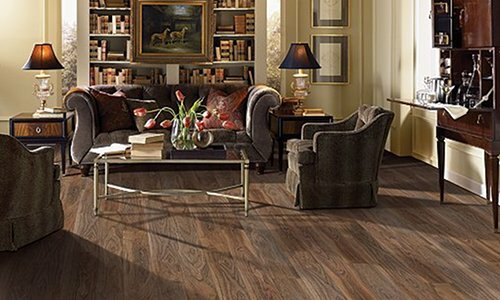 Lifeproof luxury vinyl flooring is Home Depot’s exclusive in-store brand of LVT. It has a rigid core construction (rigid base, ISOCORE pvc foam core with a vinyl top layer). One of the main attractions of Lifeproof vinyl is the price, flooring ranges between $1 and $4 per square foot. The range isn’t huge, but LifeProof does come in three different thicknesses and comes in both wood-look and stone-look styles. Lightweight and durable with an easy interlocking installation system, Lifeproof vinyl is readily available and a good product to consider as you start your research. For further information, read our in-depth LifeProof Vinyl Flooring review. Mohawk bills itself as the “world’s largest flooring company” so you would expect it to have a more than decent range of luxury vinyl tile, and indeed they do not disappoint! However, less is more at Mohawk with only 52 different but quality stone and wood LVT products, of which 14 are available with their Uniclic glueless installation technology. Mohawk recommend that all their LVT products are installed as a floating floor and they have an in-house range of cleaning products specially formulated to keep their flooring in top condition. Prices are cheaper at between $3 and $4. Having first established themselves 40 years ago in the UK and now a global player, Karndean were the first kids on the block with luxury vinyl tile and rightly respected as the luxury vinyl tile specialists for both residential and commercial property. Not only do they have a very extensive range of LVT including unusual options like their Galician Quartz pebble mosaic tile, they also have decorative strips, borders and medallions so that you can really go for a customizable look (see image below) and there is also a fantastic 20-year warranty on some of their products. A quality product but with higher prices, expect to pay anywhere between $4 and $8 per square foot. US based flooring company Harbinger has mostly been recognized for commercial flooring, but their LVT products are equally usable in residential contexts too. They have three ranges of LVT – the Contract, Signature and Craftsman series – all of which feature intricately rendered wood and stone designs. The Signature series is particularly impressive to my mind, with a focus on grey toned woods that are very much on trend at the moment – the Heritage Wrought Iron wood plank tile is truly lovely and the fabric-like Grasscloth tiles in four different color ways offer a different and refined textured look. No pricing details at this time. As you would expect, flooring maestros Armstrong have got one of the most extensive ranges of LVT product ranges currently available anywhere, with 181 different tiles to choose from! Their ranges include all kinds of looks, from distressed wood to overall graphic patterns, but their speciality is stone effect luxury vinyl tile. Their limestone enriched process give a high quality result ensuring that “each floor tile faithfully captures the authentic look of natural stone” and, to whet your appetite, the design idea images on their website are the ultimate inspirational eye-candy, as illustrated below with their gorgeous Classico Travertine tile in Sandstone/Blue. Average prices are between $5 and $7 per square foot. We also like their Luxe plank range, you can read our review here. Adura, Mannington’s residential LVT range, boasts a comprehensive 116 different tile looks including stone, wood and graphic designs. The stone tiles can be used with or without grout, and to this end Mannington have their own Adura grout which is highly recommended. A particularly nice touch in the Adura range is the 12”x24” rectangular stone-look tile that enhances the illusion that your synthetic tiles are the real thing! For near authenticity in vinyl wood flooring, go for their Distinctive Plank collection which features variable widths, realistic colors and surface textures, like the Dockside LVT plank below. Prices range mainly between $3.50 and $5.50 per square foot. This global company is primarily known for its commercial flooring ranges, and their commercial LVT range is extremely impressive – especially the Allura range which features classic and more offbeat, alternative designs for those looking for something a bit more edgy. However Forbo also offers a fantastic range of residential LVT too, which whilst being a bit more classic, is nevertheless the kind of superior product that you would expect from a company that places “excellence in flooring” at the heart of its mission statement. Expect to pay between $5 and $8 per sq/ft. Luxury vinyl tiles typically comprise four layers, and the top layer is the one that protects the tile from scratches and stain absorption. It is best to opt for tiles that have a urethane or polyurethane top layer and the thicker the better. Measured in mil, products that have top layers under 20 mil are best used in areas of light traffic; the ideal is at least 20 mil – anything higher is going to perform excellently (and generally would be classified as a commercial LVT). The overall thickness of the luxury vinyl tile or plank is an important factor when planning your floor project, particularly if you are only using LVT tile in one room and expect it to meet another type of flooring (this often happens at doorways). Also note that standard vinyl sheet is often a different thickness gauge than LVT. Thankfully, as LVT’s popularity increases, more and more manufacturers are now offering luxury vinyl tile moldings and edgings to complement the tiles, so that you can create a flawless finish to your flooring project. Moldings Online seem to offer a particularly extensive range of options, including stair nosings. Before you install your luxury vinyl floor it is important to allow it to acclimatize to your home’s usual temperature for a minimum of 48 hours, as like hardwood flooring, vinyl tile expands and contracts depending on the temperature and humidity in the air. Because of the inherent expansion in vinyl tiles, some manufacturers also recommend leaving an expansion gap when fitting a floating interlocking (i.e. 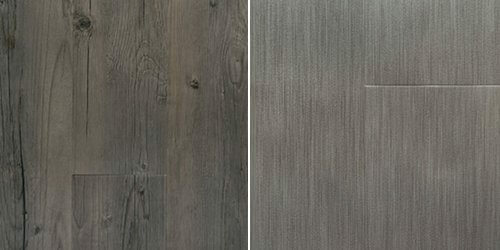 glueless) vinyl plank or tile flooring. Of course the main selling point of luxury vinyl tile has got to be its easy maintenance, essentially all you need to do to keep it clean is regularly sweep or vacuum and then damp mop with a neutral or peroxide cleaner from time to time. When choosing a vacuum for vinyl flooring you want one that is designed for hard or tiled floors, you can view a selection of the best vacuums for tiled floors at Home Clean Expert. Be careful not to use abrasive cleaners and make life easier on your flooring by adding doormats at the entrances to your home. Tiles that have been UV cured polyurethane coating are best for ultimate longevity. It has to be said that luxury vinyl tile has earned a bad reputation with regards to the environment. The nature of the chemicals involved in its production and the possibility of it emitting VOC gases once it has been installed have raised questions about its suitability for long-term use. However, reputable LVT manufacturers have made great efforts over the years to address these concerns and meet low-VOC regulations. 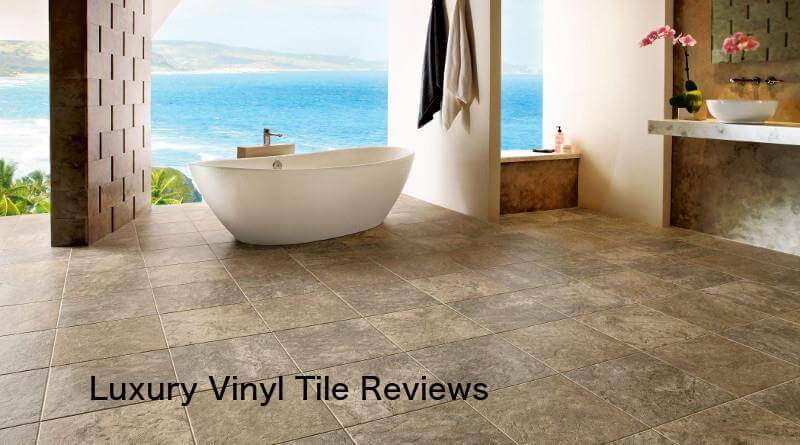 If you are concerned about these issues we strongly urge you do further research and look into alternatives before choosing luxury vinyl tile for your home. 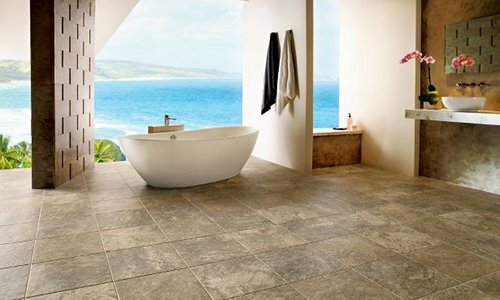 Looking for Luxury Vinyl Tile Ideas and Inspiration? Then take a look at our Pinterest board. Thanks for the articles (and comments) – excellent information. We are looking at LVT as our flooring option for a recent year round sunroom addition. This install would be over a radiant heated concrete floor. 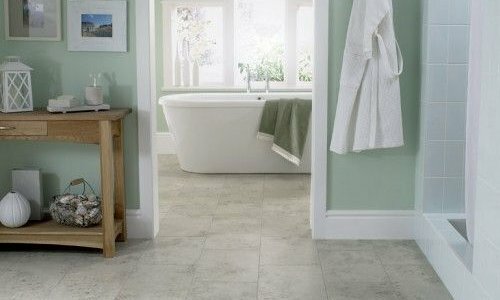 Is LVT a suitable option over a heated floor? Would also like to know if sun fading is a problem to consider as there are many windows and 4 skylights in this room. Many LVT products are a suitable option over radiant heat but you should check the manufacturers guidelines for clarification. If it’s not clear from the paperwork then call the manufacturer direct. The best sites make it very clear, here for example you can look at the products specifications and see that it is suitable. Sun fading can be a problem on any type of flooring over time and should be a consideration. Getting advice from trusted local contractors or flooring manufacturers is recommended. Hi, We have recently had a floating LVP installed in our family room and we don’t like it because it was installed over ceramic tile and makes a loud hollow sound when walked on. They should have used some sort of sound proofing underlayment, but didn’t. Anyway the company have offered to do it again but ONLY with a glue down type. What are the disadvantages of the glue down LVP over the click type? Also would a sound proofing underlayment under a floating floor eliminate the hollow sound completely or just diminish it? Hi Chris, are you doing the work yourselves? Hi. We want to install vinyl in the kitchen. Our conventional oven is somewhat close to the floor and when I use the “self cleaning” the oven can get VERY hot. Could this be dangerous? Have you heard of vinyl planks melting or becoming uneven close to the oven area? Any brands that are more heat resistant? Thanks. Great site, very informative. We are considering installing and gluing down Armstrong’s LVT in a heavy trafficarea being the kitchen, hallway and side door entrance. We are concerned with expansion, contraction to the tile due to a southern exposure from a picture window causing the grout to possibly cracking and coming loose. Are these concerns legitimate?? We considering Provenza Maxcore Uptown Chic LVP for most of our home, replacing the tile and carpeting. It is 8mm thick with a 30 mil wear layer with a multi-layered Aluminum Oxide finish and a 25 yr warranty. Is anyone familiar with this product? It runs $4.85 a sq. ft . Does $2.50 a sq. ft. For labor seem high?? We are looking at approx 1400 to 1500 sq. ft.. Would appreciate any feed back . Our last large floor redo was a nightmare with Lumber Liquidators wood laminate, horrible stuff!!! Don’t want to make another mistake like that . Where are you based Joanne? And have you requested 3 to 4 quotes from local contractors? Hello…Did you end up installing the Provenza LVP, and if so can you please let me know how you are liking it? I have a deposit down to install this product downstairs in my condo (~550 sq. ft.) & I’m excited about it but haven’t found too many specific reviews on the product. The costs you mentioned are in line with several quotes I received. I’m located near Los Angeles. Thank you! Try calling American Carpet Wholesalers in Dalton, GA. Having lived in the area for a long time, I know you can usually buy from one the many sellers in Dalton. They will ship it to you and not charge sales tax. Can you let us know how you like floor? I want to install, but can’t find reviews on this flooring. I just discovered mannington brand vinyl luxury flooring called meridian in a carbon color. It looks like stone, slate or concrete. I would use this in my kitchen and adjoining foyer. We were planning to install porcelain tile but this is so much easier!! It looks great. But in the store everything looks great . I brought a few pieces home to snap together and it still looks like the real thing. Has anyone installed this product and is there anything I should know about this type of product. I am looking for a durable product that does not look cheap…. Any info or experiences are appreciated . We have recently had a ‘water event’ from our washing machine. We are trying to decide which avenue to pursue for replacement flooring. The application is on the main floor of the home all one continuous area of entry hall, closets, washer/dryer, bathroom, kitchen, living room, dining room. Approximately 700 sf. Current damaged flooring is floating cork click-lock over a concrete slab. We have a few criteria to meet as much as possible. 1. HIGH traffic – 4 energetic dogs. 2. Easy care. 3. Resistant to sun/UV fade. 4. Warm. One bonus of the cork, it holds room temperatures better than tile. We will be having it professionally installed, yet need to watch the budget. Would like the best bang for the buck What would be your best suggestion between the LVT and tile. We would like to not have grout if we pursue a tile application. Thanks! We have a condo that has hydronic radiant floor heating under ceramic tile. We don’t like the look of the ceramic tile and are considering putting LVT planks over the tile – after skim coating the tile. Given the radiant floor heating we understand there may be some complications and are wondering whether LVT will serve our needs. We like the LVT option because it is thin, durable, water resistant, and has wood-like appearance. However we are wondering about the effect of the heating/cooling on the LVT? (e.g. expansion/contraction) Also, will the LVT be too much of a thermal insulator for the floor heating purpose? Ripping up the ceramic floor is not an option. Also, it seems the other alternatives to LVT (e.g. laminate, hardwood, etc.) come with their own limitations for this application that seem to be more problematic than LTV. Do you agree? We are looking at Paradigm LTV flooring and our question is how easy is it to clean? It is item Par 1219 and is a wood plank look that has small grooves or ridges in it just like real wood. Will these ridges cause a problem with grit and grime getting into them and making it hard to clean? Thanks for your very informative article and excellent comment section. We are thinking of doing our downstairs in LVT Coretec plus XL vinyl planks. Approximately 1200sf over a crawlspace subfloor. Has anyone used this flooring before or have any comments regarding this product. 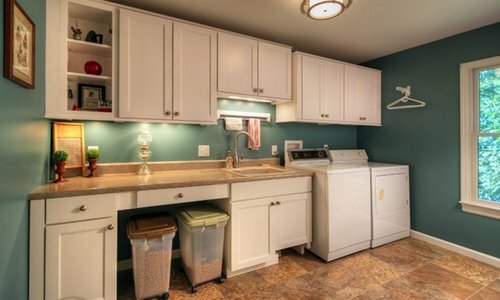 LR, DR, FMR, Kit, Laundry/Mudroom areas we are considering. Three dogs, one cat and three adults…? Yes, I used Coretec plus in my basement and laundry room. Both turned out great! Did you use an additional underlayment in the basement or just put over the concrete? We are concerned that the floor will not be warm enough if we don’t use an additional underlayment under the floor which claims to already have an attached underlayment. Thanks. We have two small dogs and 2 cats. Needless to say, our old carpet has seen better days. We are looking at replacing ALL of our flooring, upstairs and down and are considering LVT since our youngest dog has a propensity for “accidents”. I hate to think of spending that much money on replacing a full house of flooring that doesn’t meet ours and our pets needs. LVT seems like a reasonable option for wear and tear, but I also want it to compliment the house. I am fearful of spending approximately the same amount on LVT rather than an engineered wood, but getting an end result that looks cheap or lower quality. Does the LVT really have the look and feel of wood and does it hold up as far as quality and will add to the resale value of the home? Does the LVT really have the look and feel of wood and does it hold up as far as quality and will add to the resale value of the home? I advise that you go to a flooring showroom to take a look at some LVT to gauge how close you think it mimics real wood. As for quality and longevity this will depend completely on the quality of the individual product and in our experience you get what you pay for. As for resale value…if that’s a big issue I would go with real wood. LVT won’t affect your hose sale price one way or another but wood floors are sometimes seen as desirable. Stephany, did you end up getting the LVT? If so, are you happy with it and have the pets had any accidents on it? We have a senior dog who has accidents now and then. Where she has gone on the wood floor has ruined it. We don’t always find her little puddles right away. 🙁 Am trying to find a nice flooring option that will stand up to her occasional accidents. 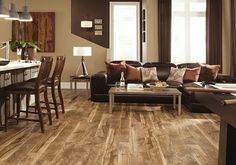 Can you please tell me how Home Depot’s Interlocking Luxury Vinyl Plank Flooring products compare to the competitors you’ve mentioned in this article. We are specifically interested in the Life Proof brand, which is their top quality product that goes for $2.99 sq ft.
Hi! I am looking at Installing flooring in my dining area but have a slider door in that area that gets the late day hot sun beaming in on it. Would I need to be concerned about the heat from the sun affecting it? I have been looking at Homecrest Cascade WPC Flooring because I found a color I like but am concerned if I should go with a different flooring that has heat resistant qualities and settle for a color I am not as in love with. Any thoughts? Thanks! Lynn did you put this floor in. I am looking it it now. I am looking at the same flooring… did you use it, and what were the results? I have this in 2 spaces in my house. 3 kids, a 65lb boxer, active lifestyle and it holds up beautifully. Easy to clean. I installed it myself and it was a breeze! What can you tell me about Triversa LVT by Congoleum in the wood grain styles? Am considering it for about 1500 sq. ft. of new slab built home including main living areas and bedrooms. Just about everywhere except the bathrooms and laundry room. It will be placed over builders sheet vinyl in some areas and in other areas, it will be in rooms with builder installed carpet which will be removed of course. What should be put down over slab (if anything) in the previously carpeted areas? This is a major purchase for us and don’t want to make a mistake. My husband has installed flooring for 25 years but switched careers 5 yrs ago. He is putting in vinyl plank in a friend’s double-wide after Hurricane Harvey. He likes the price at Lumber Liquidators for 4mm LVP Tranquility. However they said he needs underlayment. He’s never used that on LVP. 1. Is this a good brand? What is it comparable to? 2. Does he REALLY need underlayment? Or are they just trying to make more $$? 3. Is underlayment necessary because without it this particular LVP won’t last? He hasn’t kept in touch with any installers to ask them. I don’t know much about LVP Tranquility. Typically, most flooring needs some for of underlayment. This article gives more guidence. What is your opinion of Coretec Plus vinyl plank flooring and would you use an additional underlayment over concrete in below grade room? We are planning on installing LVT in our basement area. We prefer clickable LVT/LVP and not the glued down versions of flooring. We have four different areas in basement and all for are interconnected. Each areas have distinct look of stones or wood. We prefer stone looks to have a visible grout line, grout not applied but printed. Whereas wood look should not have any grout line. Also we need same brand tile so that each areas interlocks without a T-joint. Can you recommend which brand makes stone looking with grout line and wood looks without grout. Can LVP/F be used safely in a concrete hygronically heated basement without offgassing? Is there a need for underlay if the floor is already smooth? Suggestions. We purchased Mannington Adura Luxury Vinyl in the Carrera Marble finish for our bathroom renovation. The floor looks dirty even after a thorough cleaning due to the finish. Our renovator and a rep from the retail outlet inspected the floor and both agreed it looked terrible. The retailer suggested we file a claim. Mannington refused the claim stating the floor was first quality. It is not. We do not recommend this product. It has basically ruined our bathroom renovation. 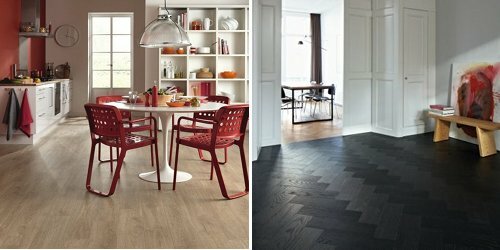 Has anyone used HAPPY FEET LVT? I have LVT in another home, but it is a different brand, thicker, etc, and much more expensive. Does happy feet need something underneath before installation. New home will be on slab, no basement. I am planning on installing Torlys luxury vinyl flooring in a mobile home, but Torlys not mentioned here. It is highly recommended in Canada, so wondering if anyone has used it? I am told for those chemically sensitive, it would be the best choice. We just looked at V-EVO Durato HD Vinyl Flooring in a store. I came home to do a little research on the brand as I have not heard of it. I am not finding much. Has anyone had experience with this brand of vinyl flooring? We have been investigating LVP flooring for a condo second floor and have looked at Shaw products , Mannington products , Lowes Smartcore Pro and the COREtec product by USFLOORS which is owned by Shaw. In my opinion COREtec looks like the best option but having a difficult time pulling the trigger. Any comments would be appreciated. We have the Shaw and have been very happy with it. My friend has the COREtek and is happy with hers as well. Don’t think you can go wrong with either in my opinion. We both have a lot of dirt traffic and it has held up very well. For me it came down to the color choice I wanted between those two brands.